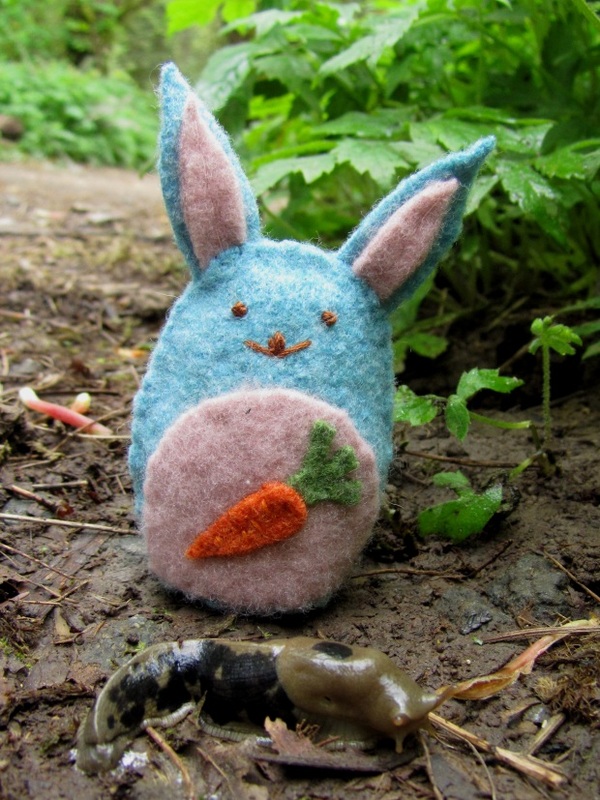 On a crisp, spring day, Hungry Bunny went out for a walk in Tryon Creek State Park in Portland, OR. I am so lucky to get to work in this beautiful park and I was able to capture his adventure with my camera. 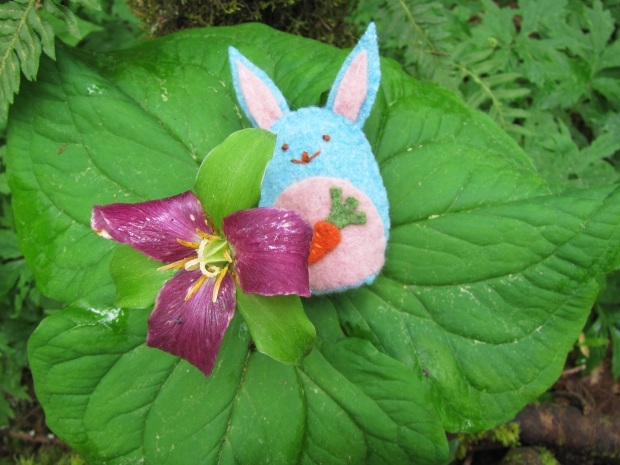 Hungry Bunny decided on a trail with waterleaf lining the edges and sword fern arching overhead. 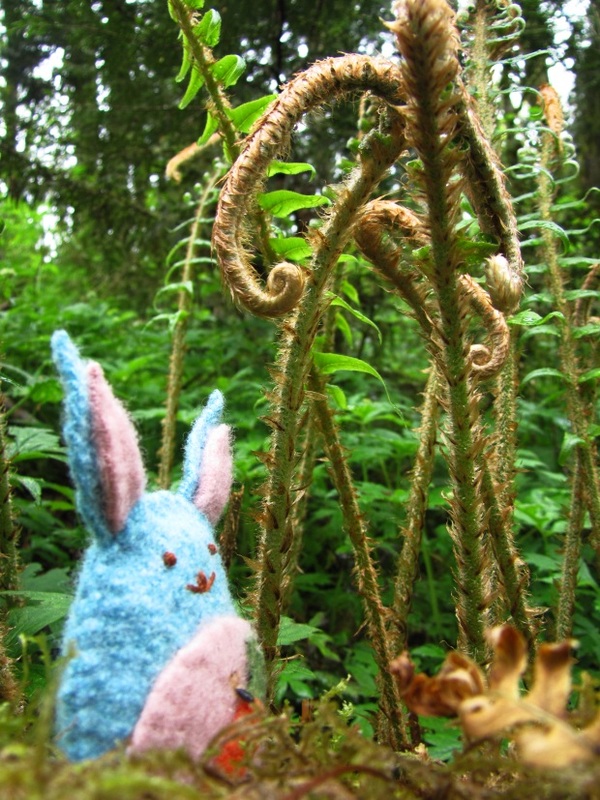 The forest is coming to life thanks to spring’s sunshine and the fiddleheads are like starting to uncurl above the bunny’s head. Did you know that violets aren’t always, um, violet colored? 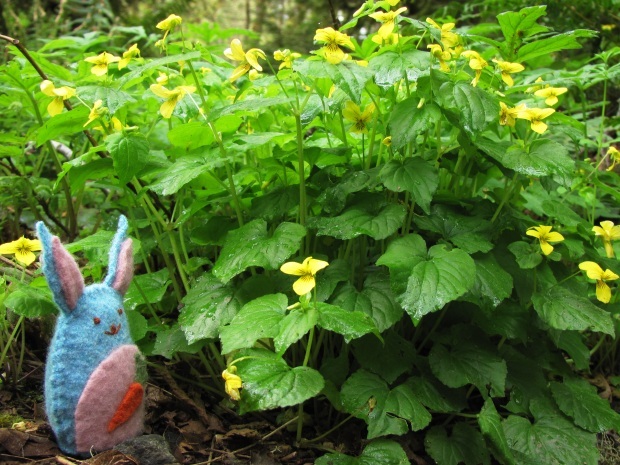 These are yellow wood violets and the young leaves and flower buds are edible. Our bunny friend stopped for a little nibble. His name is Hungry Bunny after all! 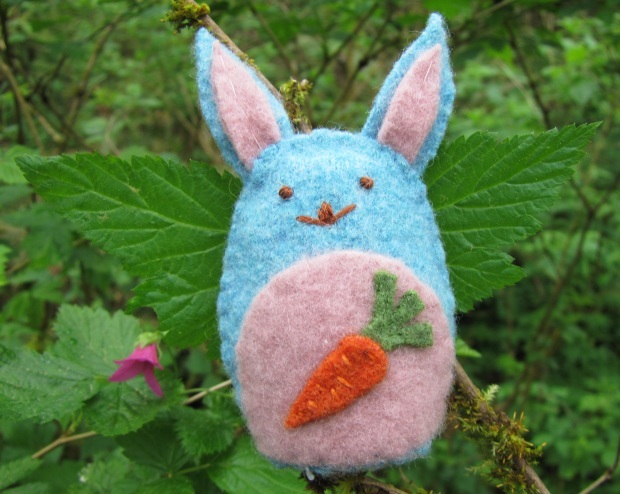 Hungry Bunny passed under some salmonberry plants and decided to take a break to play dress-up with the buterfly-shaped wings. 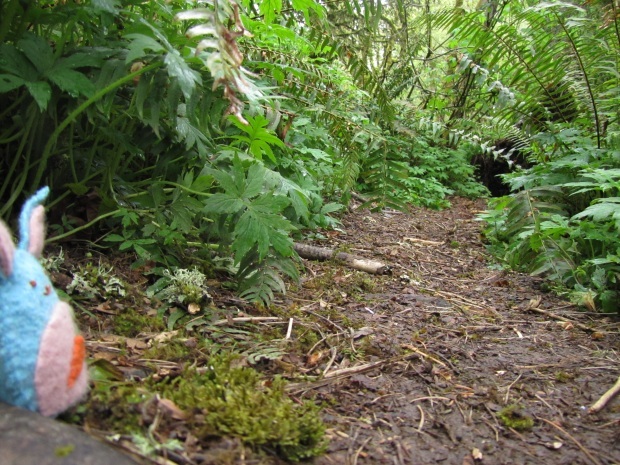 Every hiker knows they have to share the trail so he stopped to let a banana slug pass by. There’s nothing icky about these creatures. They’re decomposers that do great work in the forest. Watch out for the slime! 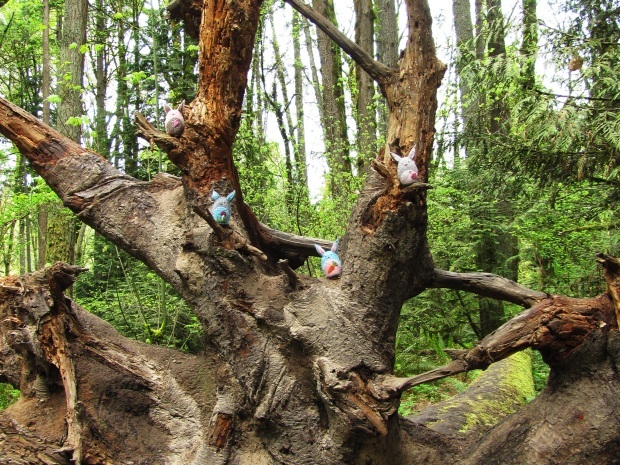 At the base of a huge western red cedar tree, Hungry Bunny met up with his pals Love Bunny, Woodland Bunny and Pretty Bunny. From their low vantage point the tree seemed to go up and up forever! 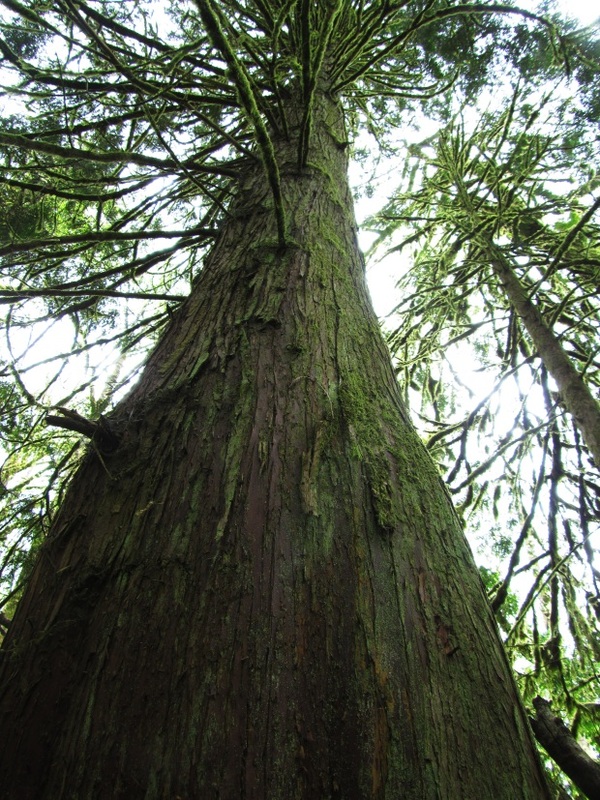 The friends frolicked in the forest and climbed the roots of a fallen Douglas fir tree. 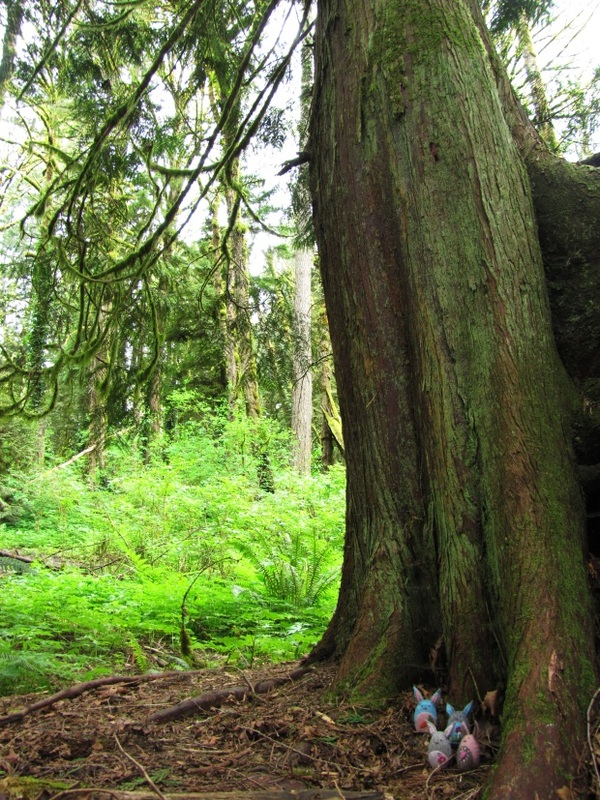 In the soft, decomposing wood of a western red cedar stump the friends had a picnic of candy flower, also known as western miner’s lettuce. 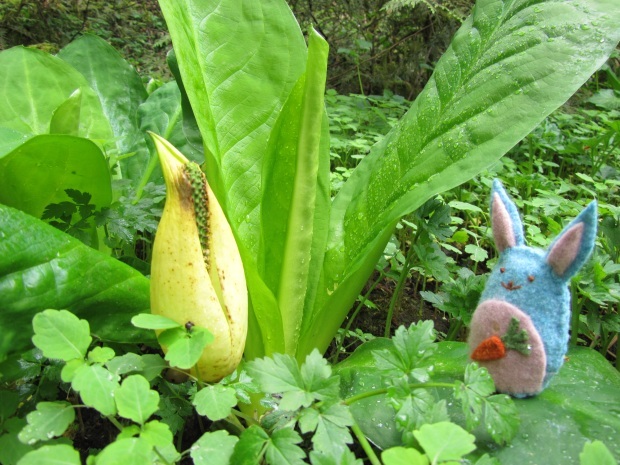 Happy and finally no longer hungry, Hungry Bunny made his way back home, careful not to linger too long next to the huge skunk cabbage plants with the smelly flowers. He ended the afternoon with a nice nap on the broad leaves of a trillium. These pretty flowers take 7 years to bloom and the petals start out white then turn pink and, finally, magenta as they age. I love the series and this cute story! Aw! I am a new follower and I just adore this post! Sooooo cute! So fun to see your area. So wet and lush, such a contrast to our desert. Thanks for sharing this! Thanks ladies! I had a lot of fun putting this together! Wow, what an beautiful series and I like it so much. Well, the rabbit was looking so cute and beautiful. Such LOVELY pictures! 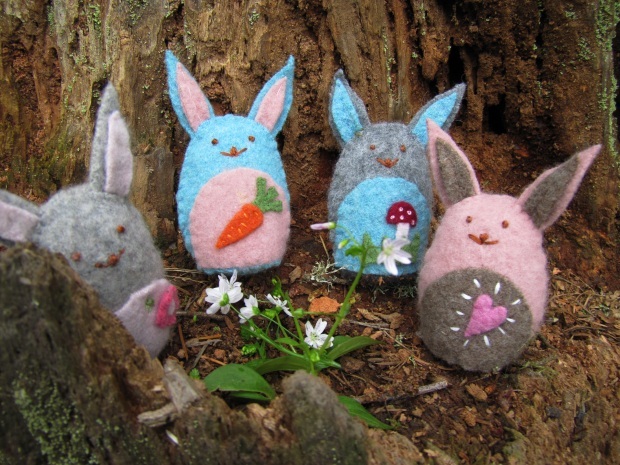 Just like visiting another land, a grand and magical forest full of amazing life! The the ferns and violets! What a treat 🙂 Thank you SO much !